One New Aftermarket Replacement Swinging Drawbar Kit (Contains Drawbar, Hanger & Clevis Assembly) Fits: -Ford Tractor models. 2000, 2030, 2031, 2120, 2121, 2130, 2131, 2N, 600, 601, 611, 620, 621, 630, 631, 640, 641, 650, 651, 660, 661, 671, 681, 8N, 9N. Dimensions: Wide 2.000" Thick 1.000" Long 29.375. 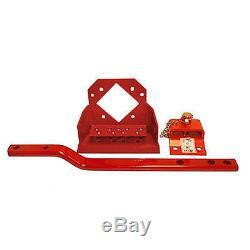 Color: RED/Primed Replaces Part Numbers: HIF10-0001, FORD DRAWBAR 8N, 49A34R, SDA6, 49B70R (Drawbar), 49B71R (Rear Drawbar Hanger), 49B73R (Drawbar Clevis Assembly). Our processing system is automated. Thank you for your continued patronage. We carry parts for Engines, Transmissions, Front & Rear Axles, Hitch & Drawbars, Undercarriages, Final Drives, Seats, Bearings, Cups, Cones, Seals, Discs, Couplers, Gears, Brakes, Pressure Plates, Pilot & Throw Out Bearings, Ring & Pinions, Gaskets, Decals and MORE for most high wear items. We also carry replacement parts for the Boom Cylinder (Seal Kits, Tubes, Glands, Pistons, Rods). The item "Swinging Drawbar Kit Ford Massey Ferguson Tractor 2000 600 601 8N Jubilee NAA" is in sale since Tuesday, February 7, 2017. This item is in the category "Business & Industrial\Heavy Equipment, Parts & Attachments\Heavy Equipment Parts & Accessories\Tractor Parts". The seller is "reliableaftermarketpartsinc" and is located in Williamston, Michigan.